People out on bail after an arrest for a DUI in Los Angeles may try to avoid going to court (and possibly to jail). But few can match David Doyle Abbey Jr.’s ability to evade capture. Until mid-August, he had managed to dodge a court appearance on DUI charges for more than 20 years. Abbey was riding a bike along a street in Anderson, California, when police stopped him as they searched for a stolen bike. When officers ran his name through the system, they discovered that Marin County had an outstanding felony warrant against him for causing injury while driving under the influence of drugs or alcohol. The police escorted Abbey to jail—21 years late—and he’s likely to remain there because the courts haven’t granted him bail. While Abbey managed to stay out of the police spotlight for more than two decades, Gilbert Phelps of Iowa City, Iowa, apparently enjoyed the chance to hang out with them. According to KCCI TV authorities pulled over the 20-year old around 2 a.m. on August 6th for speeding. The arresting officer noticed a strong smell of alcohol, and Phelps admitted that he had been smoking pot before driving. 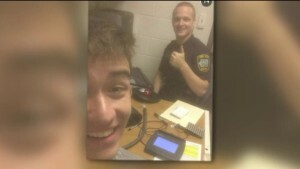 As the officer prepared to give Phelps a breathalyzer test, the young man asked if he could take a selfie with him. Police charged Phelps with a DUI. He’s scheduled to appear in court in mid-August; family and friends may want to watch for a selfie of that memorable moment in his life as well.